On Episode 121 of CrossFit Radio, Host Justin Judkins interviewed Tony Blauer and the winner of the North Central Regional, Matt Chan. The episode was webcast live at 6 p.m. PDT on Wednesday, May 26, 2010. 3:30 Tony Blauer is the owner of Blauer Tactical Systems and creator of the SPEAR System (Spontaneous Protection Enabling Accelerated Response), and he came on the show to talk about the training camp he’ll be conducting in August. He detailed what last year’s camp was like and how his business has changed with his relocation to California. Tony also talked about the mini-camps he conducts on a variety of subjects around the country, and he commented on the parallels he sees between mixed martial arts and the sport of CrossFit. 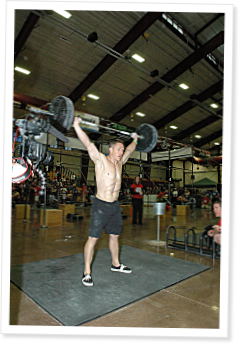 40:18 Matt Chan owns CrossFit Verve in Colorado with his wife, and he recently won the North Central Regional. Matt talked about the training strategy he’s employed this past year and how his discipline paid off. As he heads into the Games, Matt has a specific plan for training and diet, and he also gave an update on his affiliate and why he has a waiting list for new members. Tommy Hackenbruk, Tony Blauer, and the mysterious “Jakers” of FRAT fame were Justin’s guests on episode 77 CrossFit Radio, webcast live at 6:00 p.m. PDT on Wednesday, July 22, 2009.